édité le 11/03/2019 - Plus de news de "Qatar Petroleum" - Voir la fiche entreprise de "Qatar Petroleum"
Qatar Petroleum entered into an agreement with Eni to acquire a 25.5% participating interest in block A5A, located in the Angoche basin, offshore the Republic of Mozambique. The agreement is subject to customary regulatory approvals by the government of Mozambique. 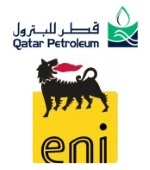 Following such approvals, the partners holding participating interest in the block will be affiliates of each of Eni (Operator) with a 34% participating interest, Empresa Nacional de Hidrocarbonetos (ENH) with a 15% participating interest, Sasol with a 25.5% participating interest, and Qatar Petroleum with a 25.5% participating interest. Commenting on this occasion, H.E. Mr. Saad Sherida Al-Kaabi, the Minister of State for Energy Affairs, and President & CEO of Qatar Petroleum, said: “We are pleased to sign this agreement, with our valuable partner Eni, to participate in exploring this frontier offshore basin and strengthen our presence in Mozambique. I would like to take this opportunity to thank the Mozambican authorities and our partners in this block for their cooperation and support”. Block A5A lies in the Angoche basin and is located adjacent to block A5B for which an affiliate of Qatar Petroleum entered into an agreement in December 2018 with an ExxonMobil affiliate to acquire a 10% participating interest. Block A5A covers a total area of around 5,133 km2 in water depths ranging from about 300 to 1,800 meters.